Just, y’know, thought I’d point that out and all. So I’m volunteering at the Space City Comic Con in Houston this weekend, helping moderate where I can. 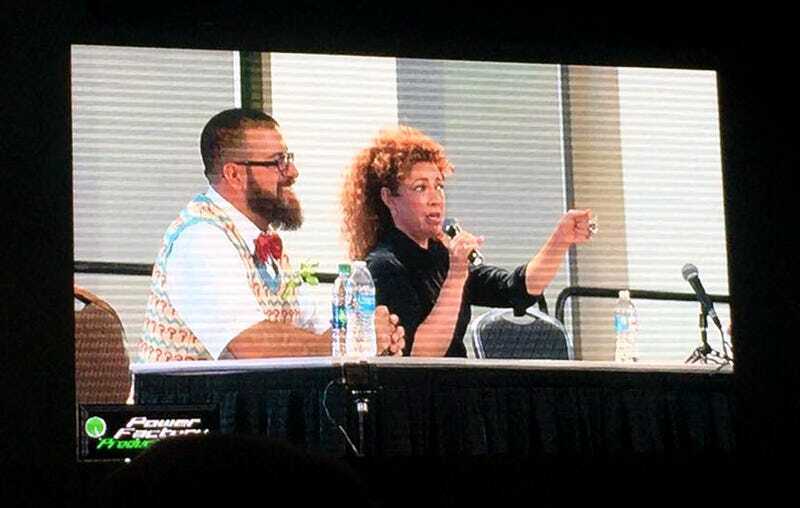 That included the amazing opportunity to be on stage with Alex Kingston, who was a blast to work with. Why isn’t there a post about Ms. Kingston? Because that was more of a Q&A panel with fans, not so much a one-on-one interview (but wouldn’t that be nice?). If you want to hear her thoughts on what’s really in River’s diary, you’ll have to find her at the Con! If you guys would like to help me get more gigs like this in the future (‘cause I know Odeck peeps are the best peeps around), please spread the word about my Monomythic.com site. Any publicity is good publicity, at this point. I’ve just posted stories about interesting street performers in Austin and an upcoming indie game that’s pretty ambitious when it comes to graphics and tone. There’ll be a lot more articles up over the summer, and maybe something’ll catch your fancy.